Carte Reduite D Une Partie Des Costes Occidentalies et Meridionales De L Afrique... 35 1/2in x 25in (900mm x 510mm). This very large finely engraved beautifully hand coloured original antique map, sea chart, of SW Coast of Africa - with an inset view of Cape Town - by Jacques Nicolas Bellin in 1754 - dated in the title cartouche. Paper thickness and quality: - Heavy and stable Paper color : - off white Age of map color: - Early Colors used: - Yellow, green, blue, pink General color appearance: - Authentic Paper size: - 35 1/2in x 25in (900mm x 510mm) Plate size: - 35in x 23in (890mm x 595mm) Margins: - Min 1/2in (12mm). Margins: - None Plate area: - Creasing along centerfold Verso: - None. 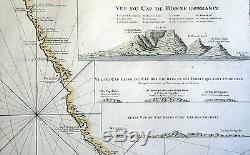 Background: This is a scarce and attractive nautical chart depicting the southwest coast of Africa from Cape Fria in Namibia to Cape Agulhas (Cape of the Needles) and the Bay of St. Blaise, including the Cape of Good Hope. It shows incredible detail along the coast with capes, bays and topographical features including mountains, rivers as well as coastal features noted. Elevation is beautifully rendered in profile. The map includes three profile views in the top right quadrant. These are Vue Du Cap de Bonne Esperance (Cape of Good Hope), Vue Du Cap Falso, Du Cap Des Eguilles et des Terres Qui sont Entre deux and Autre Vue Du Cap Falso et Du Cap Des Eguilles. Cape Town, Constance (Constantia), Stellenbosch and Hangklip are accurately identified Being part of the Mediterranean world, the northern coasts of the African continent as far as the Straits of Gibraltar and even round to the area of the Fortunate Isles (the Canaries) were reasonably well known and quite accurately mapped from ancient times. In particular, Egypt and the Nile Valley were well defined and the Nile itself was, of course, one of the rivers separating the continents in medieval T-O maps. Through Arab traders the shape of the east coast, down the Red Sea as far as the equator, was also known but detail shown in the interior faded into deserts with occasional mountain ranges and mythical rivers. The southern part of the continent, in the Ptolemaic tradition, was assumed to curve to the east to form a land-locked Indian Ocean. The voyages of the Portuguese, organized by Henry the Navigator in the fifteenth century, completely changed the picture and by the end of the century Vasco da Gama had rounded the Cape enabling cartographers to draw a quite presentable coastal outline of the whole continent, even if the interior was to remain largely unknown for the next two or three centuries. The first separately printed map of Africa (as with the other known continents) appeared in Munster's Geographia from 1540 onwards and the first atlas devoted to Africa only was published in 1588 in Venice by Livio Sanuto, but the finest individual map of the century was that engraved on 8 sheets by Gastaldi, published in Venice in 1564. Apart from maps in sixteenth-century atlases generally there were also magnificent marine maps of 1596 by Jan van Linschoten (engraved by van Langrens) of the southern half of the continent with highly imaginative and decorative detail in the interior. In the next century there were many attractive maps including those of Mercator/Hondius (1606), Speed (1627), Blaeu (1 630), Visscher (1636), de Wit c. 1670, all embellished with vignettes of harbours and principal towns and bordered with elaborate and colourful figures of their inhabitants, but the interior remained uncharted with the exception of that part of the continent known as Ethiopia, the name which was applied to a wide area including present-day Abyssinia. Here the legends of Prester John lingered on and, as so often happened in other remote parts of the world, the only certain knowledge of the region was provided by Jesuit missionaries. 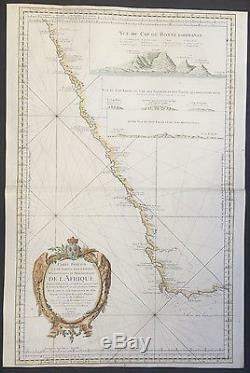 Despite the formidable problems which faced them, the French cartographers G.
D'Anville (1727-49) and N. Bellin (1754) greatly improved the standards of mapping of the continent, improvements which were usually, although not always, maintained by Homann, Seutter, de Ia Rochette, Bowen, Faden and many others in the later years of the century. Bellin, Jacques Nicholas 1703-72 Bellin was one of the most important cartographers of the 18th century. With a careerning some 50 years, Bellin is best understood as geographe de cabinet and transitional mapmakerning the gap between 18th and early 19th century cartographic styles. His long career as Hydrographer and Ingénieur Hydrographe at the French Dépôt des cartes et plans de la Marine resulted in hundreds of high quality nautical charts of practically everywhere in the world. A true child of the Enlightenment Era, Bellin's work focuses on function and accuracy tending in the process to be less decorative than the earlier 17th and 18th century cartographic work. Unlike many of his contemporaries, Bellin was always careful to cite his references and his scholarly corpus consists of over 1400 articles on geography prepared for Diderot's Encyclopedie. Bellin, despite his extraordinary success, may not have enjoyed his work, which is described as long, unpleasant, and hard. In addition to numerous maps and charts published during his lifetime, many of Bellin's maps were updated (or not) and published posthumously. 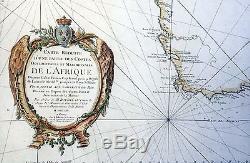 He was succeeded as Ingénieur Hydrographe by his student, also a prolific and influential cartographer, Rigobert Bonne. The World because it is usually the most decorative and America because it has the strongest regional market. Other factors that come into play re: price is rarity, age, size, historical importance, decorative value (colour) and overall condition and quality of paper it is printed on. Our collection typically includes rare books and decorative antique maps and prints by renowned cartographers, authors and engravers. Specific items not listed may be sourced on request. Classical Images adheres to the Codes of Ethics outlined by the Antiquarian Booksellers Association of America (ABAA). We are a primarily an online based enterprise, however our inventory may be viewed by appointment. The item "1754 Bellin Large Old, Antique Map of Southern Africa, inset view of Cape Town" is in sale since Sunday, May 20, 2018. This item is in the category "Antiques\Maps, Atlases & Globes\Africa Maps". The seller is "searching01" and is located in Ivanhoe, VIC. This item can be shipped worldwide.